Parade time is 2 p.m. on Saturday, March 2nd, the route will begin at Memorial Park and follow Butler Ave., to Tybrisa to the Round-about. 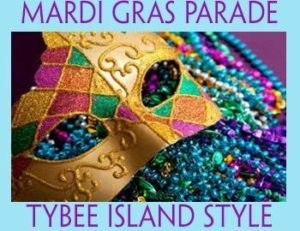 After the parade will be a costume contest in which the winners will be crowned the 2019 Mardi Gras Tybee King and Queen! The King and Queen will then host the street dance fun with music! Spectators: the parade will travel south on Butler and head towards the beach on Tybrisa St. Be sure to visit the local shops and restaurants as you’re waiting to catch your beads.